SUMMARY: On January 12, 2018, Deputy A. Jackson, from the Victorville Police Department, responded to Victor Valley High School for a reported theft. On January 11, 2018T, the victim parked his car at the school. When he returned to the car he discovered property missing from inside. A review of campus video surveillance revealed an unknown male getting into the car at approximately 7:20pm and exiting with the stolen property. Among the property stolen was computer equipment belonging to the school, valued at over $6000.00. 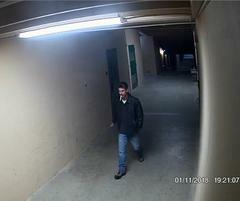 Victorville Police Department is requesting the public’s assistance in identifying the man in the video. He is described as a white or Hispanic adult male with a mustache, wearing a black jacket and shirt, and blue jeans.